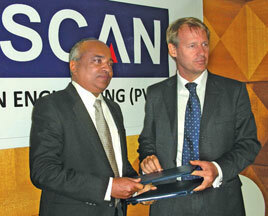 Scan Engineering (Pvt) Ltd. was appointed as the distributor of ThyssenKrupp Elevator in Sri Lanka and the Maldives recently. The "ThyssenKrupp Elevator is a premier manufacturer and service provider headquartered in Germany with sales of approximately EUR 5.2b and 44,000 employees, sales and service network spanning 900 locations worldwide", said Chief Executive Officer of ThyssenKrupp Elevator Asia Pacific Ltd. Peter Walker. "We are glad we have a reputed and exclusive representative such as Scan Engineering who will ensure a closeness to our customers in this region so as to respond faster and more flexibly to their wishes." Managing Director of Scan Engineering (Pvt) Ltd. Keerthi Abeynayake said, "Scan Engineering is happy to cooperate with ThyssenKrupp Elevator, and we have already been working on a few large projects to introduce ThyssenKrupp Elevator's products such as passenger and freight elevators, escalators and moving walks, passenger boarding bridges, stair and platform lifts as well as customised service solutions to the Sri Lankan construction industry." The new cooperation aims at serving the local market with advanced vertical and horizontal passenger transportation systems as well as premium services, to ensure that people and goods are transported safely, quickly and conveniently whether in offices, residential buildings, hotels, shopping malls, airports, railway stations and even in private homes, he said.